Taking the white paper for what it is, and with the caveat that the unspecified details of the MBA’s recommendations could change my opinion of them, I found much more to like than to dislike about it. I agree with the MBA in three important areas: its choice of a secondary market business model, its recommendation for the determination of credit guarantor capital standards, and its proposed approach to the use of credit risk transfer (CRT) mechanisms. I also am encouraged by its endorsement of the utility model—although we interpret and apply this concept differently—and I agree with its “three major objectives” for reform. My one serious disagreement is over the MBA’s contention that achieving those objectives requires legislation to replace Fannie and Freddie as they now exist. I believe that it does not. Arguably the most significant positive aspect of the MBA’s April paper is its explicit recognition of the merits of the Fannie and Freddie equity-based model for credit guarantors, and its endorsement of that model. The biggest impediment to mortgage reform over the past eight years has been an insistence on attempting to replace Fannie and Freddie with untested mechanisms seemingly designed by people with no practical knowledge of the credit guaranty business. The Corker-Warner and Johnson-Crapo proposals epitomized this failing, with their inclusion of features like the creation of a Federal Mortgage Insurance Corporation (FMIC), whose sweeping powers would have replaced complex risk assessments and business judgments best made in real time at the transaction level with simple and inflexible rules from a remote and cumbersome bureaucracy; allowing the same FMIC to put government guarantees on private-label securities (at potentially ruinous cost to taxpayers), and forcing the separation of the insurance, securitization and loss mitigation functions whose interaction allows a credit guaranty operation to work efficiently. The MBA correctly rejects these and other risky and untested features in favor of the endorsement of a model that has been proven to work. Second, unlike Corker-Warner and Johnson-Crapo, the MBA does not propose an arbitrary, fixed capital ratio for credit guarantors. Instead, “MBA’s proposal would give the regulator authority to set specific capital levels, both risk-based and overall leverage limits/ratios…Congress should have the regulator develop a stress loss capital standard rigorous enough that Guarantors meeting that standard could have withstood the Great Recession.” That is what I’ve advocated in “Fixing What Works,” “A Welcome Reset” and elsewhere, and in fact it’s the current law. The 2008 Housing and Economic Recovery Act (HERA) states in section 1110, “The Director [of FHFA] shall, by regulation, establish risk-based capital requirements for the enterprises to ensure that the enterprises operate in a safe and sound manner, maintaining sufficient capital and reserves to support the risks that arise in the operations and management of the enterprises.” FHFA has yet to implement this provision of HERA, and I agree with the MBA that it should. And while I do have some concern that the MBA might later urge FHFA to set “overall leverage limits/ratios” at the “bank-like” level of 4 percent, which would override and make moot the risk-based component, I won’t prejudge that; I’ll wait to see if it happens. With this change, the MBA breaks decisively with the proposals made by the Urban Institute and the Milken Institute, which erroneously assert that CRT mechanisms or securities can be used instead of equity capital, rather than serve as a supplement to it when they are economic on an equity-equivalent basis. In my last post (“Risk Transfers in the Real World”) I noted that the Urban Institute’s Jim Parrott included the MBA’s proposal with his own and that of the Milken Institute as variations on the same theme, with each relying either extensively or exclusively on risk transfer mechanisms rather than upfront equity to absorb credit losses. The MBA has now removed itself from this group, leaving the Urban Institute and the Milken Institute to defend their theoretical and dangerous CRT-based proposals by themselves. Where I believe the MBA errs badly, however, is in its contention that legislation is required to achieve its “three major objectives” of reform (which I support). The MBA states that legislation is needed to accomplish three of the initiatives it cites in its paper: to “Empower FHFA or a successor regulator to grant charters to…new Guarantors;” to “Create the Mortgage Insurance Fund (MIF) to guarantee eligible mortgage-backed securities,” and to “Establish a new, explicit government guarantee that stands behind the MIF.” That undoubtedly is true. But what also is true is that none of these initiatives are necessary, or even desirable, in order to accomplish the MBA’s reform objectives, obviating the need to legislate them. I’ll start with the first element: chartering new credit guarantors. It is perplexing that the MBA would combine an embrace of “utility-like regulation” with the idea that the government should be able to grant charters to new entrants. The utility concept is based on a carefully designed balance of restrictions and benefits that gives private capital a financial incentive to provide an important public service. In my version of the utility model for mortgage credit guarantors, the main restrictions are a limit to a single line of business and a cap on the returns that can be earned, while the compensating benefits are Fannie and Freddie’s existing federal charter, a backstop arrangement from Treasury should the new government-imposed capital requirements turn out to be insufficient, and protection from having new entrants erode their economies of scale. The MBA offers little justification for granting new credit guarantee charters other than “(a) credible threat of additional entrants would encourage dynamism and spur the [existing] Guarantors to provide better service to their seller/servicers and ultimately to consumers.” That would be a decent argument if there were only a single credit guarantor, but with two (Fannie and Freddie), there are sufficient market share incentives to lead to the innovation and service benefits to lenders and consumers the MBA seeks. Currently there is virtually no capital in the conventional secondary mortgage market (Treasury has taken it out), so our first priority must be to ensure we can attract sufficient capital for the $5 trillion in credit guarantees that already exist. Upsetting the balance of restrictions and benefits in the utility model by opening the door to new entrants in the future would make it much more difficult to attract the capital needed to back the credit guarantees we have today. The other two initiatives in the MBA’s plan that would require legislation are linked. They are to “Replace the implied government guarantee of Fannie Mae and Freddie Mac with an explicit guarantee at the mortgage-backed security (MBS) level only,” and to create “a federal insurance fund with appropriately priced premiums [the Mortgage Insurance Fund, or MIF].” Yet here too, the key elements of these initiatives—creating an explicit government guarantee, guaranteeing MBS rather than companies, and creating a Mortgage Insurance Fund—are not good ideas. Taking them in reverse order, the Mortgage Insurance Fund (MIF) is not insurance. True insurance works by charging a large number of people (or institutions) small dollar amounts of premium in order to be able to pay a small number of people (or institutions) large dollar amounts when they have losses. With two or at most a handful of credit guarantors—subject to the same risk-based capital requirement, utility-like return limits and regulation—their credit performance will differ only slightly. In a stress environment, therefore, all guarantors either will have the right amount of capital or they won’t. If we believe the dollars the MBA proposes to go into the MIF are necessary to meet our updated standard of taxpayer protection, that amount should be built into the credit guarantors’ capital requirements by FHFA. Separating it, funding it differently and calling it an MIF is wholly cosmetic. The close correlation in the credit performance of a small number of guarantors with the same capital requirements, return limits and regulation also is the reason it is not a good idea for the government to guarantee only mortgage-backed securities and not the guarantors themselves. The government will set the stress standard for guarantors, so they should have only a remote chance of failure. But if one does fail, it is quite likely that both (or all) will fail, in which case a policy of guaranteeing only existing MBS but not guarantors would leave no secondary market mechanism that could finance the new mortgages required to keep the system from melting down. Which leads me to the government guarantee itself. I believe every effort should be made to reform the secondary market in a manner that does not require an explicit guarantee from the government. Conservatives in Congress, and particularly in the House, will fiercely oppose adding a government guarantee to privately insured mortgages. And one is not essential. In “Fixing What Works” I proposed that “in an ‘exchange for consideration’ [for the imposition of utility-like return limits] the government would commit to provide temporary support to the companies should their capital ever prove insufficient (which by design would be highly unlikely).” Such a backstop would benefit homeowners through lower resulting MBS yields, while benefitting taxpayers by ensuring the continued survival of the companies even in a crisis. And the moral hazard of this arrangement would be minimized by stress-based capital standards, capped returns, and the fact that the companies would not benefit from repayable government loans unless they suffered losses extreme enough that their stock prices plummeted, top management lost their jobs, and the companies had to recapitalize themselves (and repay their loans) by raising large amounts of new equity at very low stock prices, badly diluting their existing shareholders. Should a short-term backstop of this type prove to be politically unacceptable I still would not favor an explicit government guarantee on MBS (or credit guarantors). Binding risk-based capital standards, set to withstand a 25 percent nationwide decline in home prices and endorsed by the government, should be conservative enough for the MBS of a guarantor subject to this standard to find broad and deep acceptance among international capital market investors, at competitive yields. Taken as a whole, the MBA’s April white paper significantly narrows the differences between its previous position on mortgage reform and the administrative reforms I advocate. The MBA now endorses the Fannie and Freddie equity-based model for secondary market guarantors (and rejects untested and unworkable alternatives like Corker-Warner, Johnson-Crapo and those of the Urban Institute and Milken Institute), agrees that credit guarantors need to be given risk-based capital requirements updated to current standards of taxpayer protection, and sees merit in the concept of utility-like regulation and returns for guarantors. And in the one critical area in which we differ—the need for legislation—strong arguments can be made against each of the MBA’s reasons for it: enabling new credit guarantors (inconsistency with utility model principles), authorizing a Mortgage Insurance Fund (it’s not insurance and should be included in required capital), guaranteeing MBS and not companies (it would expose the system to collapse) and putting an explicit government guarantee on mortgages (it’s politically controversial and there are better alternatives). In my view, all of the MBA’s stated objectives for mortgage reform can be achieved administratively, without incurring any of the complex risks involved in a transition from the existing Fannie and Freddie to new (and essentially identical) companies created through legislation. The MBA acknowledges these transition challenges, but does so only in concept, offering principles it says should guide Congress, FHFA and Treasury in addressing them. That is not enough. Before any legislation is proposed, let alone passed, advocates for replacing Fannie and Freddie must show that they have identified and understand all of the related transition issues, have concrete and detailed solutions for them, and can demonstrate that the benefits of what they propose outweigh the risks. The most daunting transition obstacles are ones the MBA does not mention: the complications created by Treasury and FHFA’s management of Fannie and Freddie in conservatorship, and the plethora of lawsuits filed as a consequence of that management. Shareholders of the existing companies met all of their regulatory requirements in September of 2008 yet still had conservatorship forced on them, and once they overcame the effects of inflated expenses put on their books by FHFA, Treasury and FHFA conspired to take all of their profits in perpetuity—an action the D.C. District Court of Appeals recently ruled was lawful. New investors will not supply the capital required to move $5 trillion in mortgage guarantees from Fannie and Freddie to their envisioned replacements (or to recapitalize the companies if they are brought out of conservatorship) until the uncertainties surrounding the rights of shareholders in the existing companies are definitively resolved. The lawsuits and the issues attendant to them that would be a serious impediment to a legislative reform process can be addressed and dealt with in an administrative one. Indeed, that is probably the only way to resolve them. The MBA has gotten almost to the right place in its April white paper; it could get all the way there by dropping its insistence on unnecessary and unlikely legislation, and embracing an administrative reform process that can succeed in delivering on the objectives it says it supports. del court ruled against pagliara on preclusion grounds, that he was a party to another federal case (lost in virginia federal court) deciding essentially same issue, so cant relitigate again in delaware. i have always thought pagliara has enough information and belief to bring a dgcl section 170 case without first resorting to books and records inspection. my hope is that pagliara simply goes ahead and files the section 170 (illegal dividends) case. i expect that pagliara’s coumsel expected court not to apply preclusion because perry decided that shareholders could bring direct claims, while the virginia court said they couldnt, and perry was decided after the virginia case. i am not sure why the court didnt take that position, frankly. I don’t know either the firm or its principals; I’ll need to wait to see what they have to say. i thought the moelis presentation was excellent: practical, feasible and achievable. i wanted to ask whether their projections of capital raise amounts was compatible with a utility-like regulatory overlay that limited returns, but the queue didnt get to me. (i would think it is, though the regulated limits on returns would have to be flexible enough to satisfy the capital markets). i look forward to your consideration of this proposal in your next post, comparing it to other proposals such as MBA etc. i also hope they dont fire the analyst who left the red sticky saying he couldnt get the lines out of the table…. I’m a little over half way through a quick read of the Moelis “Blueprint” (I didn’t listen to the call) but am about to head out for several hours. My reactions so far are (a) after seeing a flurry of proposals for legislative reform that would eliminate or recharter and restructure Fannie and Freddie, it’s good to have something out that makes the case for administrative reform, building on the companies that now exist (and have proven to work well in the past), and (b) the Moelis capital numbers for Fannie and Freddie are arbitrary, based on bank capital requirements (while Fannie and Freddie aren’t banks), and if actually followed would make it very hard for the companies to price their guarantees to be competitive in insuring the broad mix of business necessary to keep their business volumes up. To their credit, the Moelis analysts recognize that their capital numbers are only guesses, saying “FHFA may elect to implement a more nuanced risk-weighting system for mortgages, as compared to the fairly simplistic (e.g., 50% RWA) approach applied to multi-product banks.” Indeed FHFA should, and if it does it would not only make Fannie and Freddie more competitive with their guarantees, it would lower their overall capital needs, making recapitalizing them less challenging. One final point I’ll make is on CRTs. Moelis doesn’t make the point (perhaps because they really don’t understand it) that CRTs HAVE to be converted to “equity equivalents” in any capitalization scheme that is put into place. Moelis seems to be assuming that the CRTS will count at face value, when in fact they are only worth a small fraction of that. Making this correction adds to the requirements for hard equity for the companies. ROLG, the document says the companies will raise capital by (among others) doing an IPO. That would wipe out existing common shareholders? Is it possible for them to exchange their shares for the new issue? Thanks! The plan calls to raise additional common equity through an IPO, not to eliminate the current common equity, which the government owns 79.99% of through warrants. Although the current common will still exist in the proposed plan, it will be significantly diluted through all the capital raises required. They are estimating the equity to be worth anywhere between $8 to $13 per share after all the dilution is done with. Forgive my ignorance, but how do they expect to raise capital from a new IPO when the current shareholders have gotten, excuse my French, the “shaft” the last several years? Who are these individuals who’ll shell out capital towards a company the government just used as a slush fund with no consequence? In this plan, the shareholders get made close to whole as per the original agreement (the plan highlights that if passed it pretty much will end all NWS litigations). The government will consider their SPSPA repaid in full under the original 10% agreement which it is very close to being, and still has the 80% equity through warrants which were part of the original agreement as well. And it seems like this is a blueprint that the largest shareholders are actually heavily in favor of. I don’t believe there will be must resistance from shareholders if any if this is the path chosen for the GSE’s. it appears that the moelis blueprint has fhfa supervising g-fees, capital ratios and underwriting quality. is there something in the notion of utility regulation that you have in mind that goes beyond this? for practical purposes, isn’t the setting of g-fees and required capital ratios tantamount to the setting of permitted returns? perhaps you can address this in your next post. This is a piece by Michael Stegman, who was Treasury’s Counsel for Housing Policy at the time the net worth sweep was passed and now is at the Bipartisan Policy Center (after a brief stint at the National Economic Council during the Obama administration). I wouldn’t really call it a “proposal”–it’s rather a thought piece about different approaches to dealing with affordable housing requirements in legislation that would replace Fannie and Freddie with some alternative mechanism that has an explicit government guaranty (which Stegman is in favor of). Stegman notes that differences of opinion on whether to have enforceable housing goals in the credit guaranty system proposed in the Johnson-Crapo legislation was a primary reason that bill couldn’t get out of committee, and in this piece he suggests alternative ways of addressing the affordable housing issue that he thinks might bring progressives and conservatives together on it. I have a couple of reactions to the article. First, I don’t support Stegman’s goal of replacing Fannie and Freddie with a bank-centric alternative, so discussions about potential ways to go about it aren’t of great interest to me. Related to that, however, the Stegman piece is yet another example of how difficult it has been, and in my view will continue to be, to come up with legislation to replace the companies that can actually pass and become law. Issues such as whether the new credit guarantors should have an explicit guaranty or no guaranty, the transition from the existing system to the new system, how to raise capital for the new guarantors at the same time as the government is taking all of the capital of the two guarantors (Fannie and Freddie) that exist currently, and what form of affordable housing requirements and enforcement the new system should have all are still at “we need to figure this out” stage. Stegman thus joins a long list of people or entities (including the Mortgage Bankers Association, the American Bankers Association and the Urban Institute) that helpfully identify some of the problems, state either “principles” for solving them or possible approaches to doing so–without coming out in favor of any one specifically–in the hope that someone else will come up with a way for Congress to legislate the outcome they’ve been trying to obtain for the last eight-plus years, without success. Hey Tim/ROLG! Any opinion on today’s development on Sweeney’s court? Thanks! the core of the Ps argument can be found at pps 38-44, but the whole transcript can be profitably read. in particular, starting on p 64, P counsel talks about the dgcl s 170 claim that the nws violates delaware law re dividends impairing capital, and how a books and records inspection is an important step in bringing that claim. the judge was engaged and prepared. we shall see. The judge TAMIKA MONTGOMERY-REEVES graduated law school in 2006. She was nominated by the Governor of Delaware, a member of the Democratic Party. If anything, Democratic appointees have been 100% on Fed side and nothing from Pagliara’s Oral arguments seems to sway that. A young judge with added influence of Munger’s Reciprocity Tendency to the Democrats isn’t going to stir the pot on this Obama era case. Bush appointed Sweeney court may be our best shot at this point. Tim, this leads to a question for you, if every single legal case is lost, as the trend seems to indicate, what do you think is the likelihood of the GSEs coming out of conservatorship as a Utility (by your definition of Utility, not MBA’s)? I’ll be addressing your question about handicapping the possible outcomes of reform efforts in my next post, which I should be able to get out early next week. Don’t be so quick to dismiss her. Her background suggests that she has the understanding needed to make an informed ruling here. “Montgomery-Reeves was a partner at Wilson Sonsini Goodrich & Rosati, where she focused on corporate governance, navigation of corporate fiduciary duties and corporate litigation. She also practiced in the securities and corporate governance department of Weil, Gotshal & Manges”. Somewhere along the line, a judge is going to become famous by respecting the rule of law and prioritizing justice over politics. It might very well be her. We shall see. ROLG – I attended the Pagliara Oral Arguments and can personally attest that Judge Montgomery-Reeves was far more engaged with the plaintiffs than the defense. Unfortunately the mike was broke and it was very hard to hear the attorneys. Going through the transcript last night and finally being able to read verbatim the various arguments in clear fashion reinforced my original belief that the Judge was much more interested in Barr Flinn’s analysis than the governments. BTW – It was a great privilege to meet both Tim Pagliara and Gary Hindes at the court session. It was just the three of us and one reporter in the back of the courtroom! if you were in the company of pagliara and hindes at the hearing, then you are a great american, bwadden! however, after having reviewed carefully the transcript and tape of the perry argument, i would have laid heavy odds against ginsburg siding with judge millett. so we shall see. I just have the underlying feeling that somebody’s in a mad rush to wind down the GSE’s before the clock runs out. No, in these front-end CIRT deals the insurers are taking on real credit risk, but it’s risk that’s very remote, and they are being extremely well paid to bear it. Given the quality of loans Fannie is being told to insure by FHFA (and Treasury) both these CIRT deals and Fannie’s securitized CAS transactions are uneconomic for the company; it almost certainly will pay far more in premiums than it has any reasonable chance of receiving in loss absorption, because no loss transfers will take place until after Fannie has taken the first 50 basis points of credit losses itself. When I was CFO at Fannie (from 1990 to 2004), our average annual credit losses were less than 3 basis points per year. Based on that performance, I suspect none of the fifteen annual books of business we put on would have resulted in a dollar of risk transference had we covered all of them with the types of CAS and CIRT transactions Fannie is doing today, and we would have paid billions of dollars in premiums for “coverage” of them. What makes CAS even worse than CIRTs is that in the case of CAS if there ARE credit losses above the first-loss threshold (which typically is 100 basis points on CAS, not 50) it is highly likely the risk-bearing tranche will have paid off by the time those losses occur, leaving Fannie to take the losses itself. At least with CIRTs the mortgage insurers will still be there to take them. As I’ve said in the past, Fannie is doing these CAS and CIRT deals not because they make economic sense but they are being told to. Treasury’s stated rationale is, “the company has no capital (because we’re taking it all), so they must transfer credit risk to the capital markets (via CAS) and the mortgage insurers (via CIRTs).” But even that rationale is flawed; if Fannie weren’t paying the premiums on CAS and CIRTs it would have higher earnings that would be paid to Treasury in the quarterly net worth sweeps. Treasury is wasting what has been deemed by the DC Circuit Court of Appeals to be the government’s money essentially to make an idealogical statement, yet none of the budget watchdogs are criticizing it for that. Tim, I hope you are enjoying Europe. Does it concern you that Crapo and Corker have grabbed the legislative reins on GSE reform again (reported by Politico)? Would Republicans be able to pass a bill without Democratic support? What are the odds something like that happens without strict oversight from Mnuchin? Thanks in advance. As I’ve noted elsewhere, the recent rulings in the net worth sweep cases (first the Perry Capital appeal in February, then lower court decisions against Roberts and Collins subsequently) have temporarily blocked the path for administrative reform, so it’s not surprising that Corker–who is a committed opponent of Fannie and Freddie–would step into the vacuum and attempt to generate support for his legislative objective of replacing the companies with a bank-centric alternative (or that Senator Crapo would support him in this effort). What may happen next, including with respect to the issues you raise, will be the subject of my next post, which I’ll start working on during the plane ride back to the states early next week. if corker/crapo propose some “compromise”, as corker puts it, i will be curious to see how he proposes to introduce sufficient private capital into the mix. he referred to the federal govt line as capital in his colloquy with watt, and i wouldnt be surprised if there is some federal govt guaranty to serve as an important component of the total capital mix. how this federal govt guaranty squares with corker/crapo’s aversion to federal bailouts is beyond me, as you are simply making clear that a federal buyout is baked into the proposal. Seems to me that the guaranty to which you surmise could be a precursor to their “justification” to exercise warrants. But as Tim has said in the comms box of a previous post, strike price, number of warrants exercised and timing of those sales are critical to get all on board etc. are CRTs not collateralized? are the purchasers of CRTs simply making an unsecured promise to pay on losses in the future, and are those purchasers not bankruptcy remote? if so, then are CRTs simply a chimera? if CRTs are uncollateralized and a simple promise to pay in the future by an obligor that can stay enforcement of its obligations in bankruptcy, then what “capital” has been introduced into the housing mortgage finance system? all you have done is introduced “credit” as an ineffective substitute for capital. There are two possible interpretations of Watt’s comment about CRT counterparty risks. The first (which I wouldn’t rule out) is that he doesn’t understand how these deals work. The second is that he is referring to the credit risks the CRT deals are advertised as covering (i.e., losses over 1 percent of the initial principal balance, up to 4 percent) but may not in reality, due to their prepayment features. The structure of the deals is straightforward. They are issued with a dollar face amount, which is reduced primarily by (a) scheduled amortization, (b) unscheduled prepayments, (c) credit losses within the range the tranche has been issued to insure, or (d) in full at maturity (typically in 12 years). So they are not “an unsecured promise to pay on losses in the future; if losses within the coverage band are incurred by Fannie or Freddie, they have the legal right to deduct those losses from the principal due to the investor on maturity of the notes. The real risk–to Fannie and Freddie–is that the CRT notes are paid down, through scheduled amortization and unscheduled prepayments, before the companies have absorbed all the credit losses they have to take before they are allowed to deduct further losses from the balances due to investors in their CRT notes. That’s what Watt may be calling “counterparty risk” for the CRTs–that the notes may in fact not provide the coverage they are supposed to because they have been structured to repay so quickly. But if that’s what Watt wants Fannie and Freddie to manage, there is a very simple way to do that: have them not issue CAS and STACRs in the first place. They should keep the guaranty fees they otherwise would have wasted on interest payments on these securities (which have very little chance of ever absorbing any meaningful amount of credit losses), and use THEM to take any excess losses. i assume that these counterparties are themselves regulated, but since they are not listed, i cant tell. As of the end of last year, Fannie had only $3.1 billion in face value of CIRT transactions outstanding, virtually all of it with the private mortgage insurance industry. It’s odd that Watt would be calling attention to that relatively modest exposure, which pales in comparison with the nearly $500 billion in mortgage insurance in force Fannie has from that same industry. There is counterparty risk to the company from the MIs in both, but the former (CIRT) is an afterthought compared with the latter. Collins case got tossed this evening, Wondering if ROLG or Mr. Howard have any thoughts on this or are the court cases just a side show now with Watt getting ready for recap. the collins const (and apa) claim will go up on appeal to a rather conservative 5th circuit (though not sure anymore whether cons v lib means much in terms of the gses). judge atlas’s opinion on fhfa not being unconst structured was cursory even for a 1L student. watch for the 5/24 arg in PHH in dc cir en banc. essentially the same argument, with olson arguing that cfpb is unconst structured. also i expect an appeal in perry for writ of cert to scotus w/in 90 days of 2/27 date of perry majority opinion. expect to see unconst structured arg combined with nondelegation argument, if perry majority is right on construing hera. scotus usually declines to review a case absent split in circuits however. ROLG, since the Plaintiffs filed a petition for re-hearing, doesn’t that action stop the clock on the 90 days? Government now has until June 2 to respond to the petition for re-hearing. Why go to scotus when the re-hearing is still pending. that was the class action plaintiffs on their breach claims. i was thinking of the institutional plaintiffs on their apa claims, and raising constitutional claims on cert. i do believe that plaintiffs can split apart and take separate appeal tracks. my bad. i just noticed that the institutional Ps joined the class action Ps in filing notice for rehearing. the issue identified for rehearing was relevant to the class Ps claims, but i agree that it sufficed to stop the clock for any petition for scotus cert. I don’t know if you remember me, but my name is Michael Cohen, and I covered FNM and FRE as a sell side analyst from 2003-2005, and we were shareholders of FNM at SuNOVA in early/mid 2007 when it appeared that the markets had created an opportunity for FNM/FRE guaranty business. I now run my own investment research business and work as an outsourced analyst for my clients. Prior to the last month, I have not paid close attention to the GSEs since the financial crisis, and my general perspective was that judges would ignore rule of law to punish the GSEs regardless of the merits of their cases. My sole interest has been downloading FNM’s “data dump” every quarter and running queries to monitor underwriting standards as it pertains to the MIs. Nonetheless, I have recently started reading up on the situation, and I have found your blog to be captivating with amazingly interesting discussion about how this situation is ultimately resolved. I have a couple questions that I can’t really answer for which I was hoping to get your perspective….and I totally respect your perspective that your blog is NOT a forum for discussing the value of the securities. In that vein, I have a couple of structural questions that I wonder if you would be kind enough to answer. 2)If indeed the government decides to recap and release, how do you think the parties will distinguish between the government’s right to a “return on capital” vs a “return of capital”? Put differently, if the Sr Pref could NEVER be paid back, one could argue that all of the payments to date constitute a return ON capital for Treasury. Thus, I don’t really understand the argument that some have put forth saying the Treasury has been paid back and then some. the implication is that Treasury is entitled to get its pref paid back in FULL and still owns 80% of the common of the companies. I can’t recall if you have offered your opinion on such. These are all good (and relevant) questions, and illustrate how complex this topic is. I’m currently traveling in Europe (hence the 2:15 am EST time stamp on this comment) and at this point can only give you a brief answer, although I’ll say that after I return to the states at the end of the month I’m intending to do a new blog post that gives my take on the current “state of play” of mortgage reform efforts. There are legal, factual (and counterfactual), economic and political considerations that all interact to make it very difficult to handicap the future of Fannie and Freddie. The warrants obviously fall into the “economic” category, but they only have value if the companies are preserved as going concerns, which their political opponents are adamantly opposed to. The position of Fannie and Freddie’s opponents currently is being supported by the courts, with their legal decisions uniformly in support of the legality of the net worth sweep (with the most recent ruling coming yesterday, in the Collins case), and that in turn plays into what you call the “return on capital versus return OF capital” issue. As long as the net worth sweep is deemed to be legal, the government is the rightful (at least in a legal sense) owner of all the companies’ net income in perpetuity, making it difficult for Treasury to give that up in a reform, recap and release proposal. Yet if it wants to get these companies out of the government, it has to do something, and Mnuchin knows enough about the mortgage market to understand that whatever he does has to make economic sense, and be based on the facts (not the fiction) of what happened to cause the previous crisis. So it’s all very complex and crosscutting. But I’ll try to make it a little more understandable in the next post I put up. my guess is that many congressional opponents of fannie and freddie would love to see a regime where the federal govt retains the profit sweep, and the reintroduction of private capital is made only through credit risk transfer transactions. it is also my guess that mnuchin knows this is unrealistic. Realism seems to be coming back into the picture as reform gets more serious, and there is a serious player like mnuchin involved. it was encouraging to see that the most recent MBA proposal referenced the need for monoline insurers to provide MBS insurance guarantees (and not rely just on CRTs). of course, MBA couldn’t see its way to rely on freddie and fannie being the sole or predominant insurers, but its acknowledgment of a role to be played by some type of utility-like regulation indicates that fannie and freddie will be predominant, even if the MBA can’t see its way to acknowledge that. i say this because utility-like regulation encourages a competitive landscape of a few (or one) competitive players rather than a multiplicity of competitive players, since utility-like regulation encourages large scale, given the need for investment returns to be modulated in order to promote the interests of other stakeholders in the utility-like regulatory scheme. tim, perhaps you can address this in your next post, but i think once you acknowledge the eminent good sense of keeping fannie and freddie in existence and making sure there is substantial capital buffers, and then pair that with a call for utility-like regulation, you cannot rely solely on CRT transactions and the continuation of a capital markets-antagonistic net worth sweep, and any call for multiple monolines will be impracticable (given the size, scale and human talent advantages of fannie and freddie, which present huge barriers to entry in any market subject to utility-like regulation). your post makes clear that the federal govt has a financial incentive to keep the sweep and try to somehow add capital through CRTs, and a financial incentive (warrants) to recapitalize FnF. except one path leads to MBS liquidity and insulation of taxpayer risk, and the other doesn’t. corker/crapo probably have a 50% chance of guessing which one to choose, while mnuchin has a 100% chance. My belief is the government can’t have it both ways on a number of fronts. They can’t end the GSEs role in the MBS market and continue to sweep profits. On the other hand, they can continue to sweep profits, but they won’t ever get FNM and FRE out of conservatorship. They can’t monetize their stake without allowing existing investors to monetize theirs. If they continue to sweep profits, the GSEs would remain an “unresolved” issue. To be clear, “unresolved” does not equal problematic. Put different, regardless of their capital structure and ownership profile, the GSEs are performing their function well and the Agency MBS markets are healthy. Without a crisis, the urgency to legislate is lower. If they treat the amount of the NWS over 10% as as a “return of capital”, the warrants reach a point where they theoretically become valuable (assuming the GSEs are allowed to retain and build capital to prudent levels). If Corker/Crapo decide to wind the GSEs down, they are flushing roughly $135B of value that is the property of US Taxpayers down the drain without a particularly attractive offset. While I am certain that I am probably overestimating how attuned Americans are to housing finance, I do know that the NWS is assumed to continue in the budget. Winding down the GSEs would blow a hole in such, which is one of the many obstacles that Corker faces in implementing his vision. as i imply from your post, inertia is the greatest force in the universe. so, the status quo “could” be maintained. except that the current treasury secretary has gone on record that the status quo is unacceptable. as well, the potus budget proposal makes clear that future NWS contributions are subject to reform adjustment. so, i cant predict the future, but i believe that IF there is resolve to interpose private capital before a govt guaranty of MBS cash flow (or future govt credit draws), even assuming such a govt guaranty is on offer, then either CRT transactions can supply this sufficient private capital buffer, or as i think is more realistic (as i am well instructed by tim’s blog posts), that a sufficient entity level capital buffer at fnma and fmcc is needed, then the NWS must be terminated…and what better basis to do so then to point out that based upon original bailout terms, the govt has been repaid both 10% ON, and the entire principal amount OF, the total govt bailout amounts advanced. I think the 2008 “seizure” was done cleverly. As was the 8/17.2012 net worth sweep. There are no built in transition mechanisms so they need to be constructed by proponents. Another clever thing they did was to delist the GSE common and preferreds, so normal institutional investors bailed and left the hedge funds to be the proponents of change. Still, Moelis (Paulson, Blackstone) is pretty decent and might be a catalyst for change. During Mncuhin’s Senate testimony, Bob Corker mentions there are 75 days to settle the differences that he (and presumably Mnuchin) have with Mel Watt over the dividend. That would equate to ~ 8/1/17. Any idea why that date is critical, as it goes beyond the 6/30/17 date that the Q1 coupon payment is due. My hunch is that since the Q1 div is already scheduled, they are expecting it to be paid and off the table for discussion. It appears that they are focusing their attention onto the Q2 div, which should be announced around 75 days from now (8/1/17). In his speech to the North Carolina MBA Watt says the right things about Fannie and Freddie’s CRT programs, but FHFA has been saying the right things about these programs for some time and then not doing them. What’s so puzzling about this last statement– “the cost of these CRT transactions should not exceed their CRT benefits”–is that for the three-plus years FHFA has been requiring Fannie and Freddie to do CAS and STACRs it apparently hasn’t bothered to determine whether those issuances violate this cost-benefit principle. It’s not at all difficult to do. Unless Fannie has forgotten how to assess and price mortgage credit guarantees since I left, it can use its random home price and interest rate generation processes to project mortgage defaults, loss severities and prepayments over several hundred (let’s call it five hundred) different paths, both with and without CRT coverage (the pay-down and loss absorption algorithms of the risk-bearing tranches are readily modelable). It then can compare the economic results of these two sets of projections and ask itself: (a) is the average amount of net income over the 500 scenarios greater or lesser with CRT coverage than without it, and (b) if it is lesser, in what percentage of the scenarios does CRT issuance yield a better result than self-insurance? For Fannie’s and Freddie’s current CAS and STACRs, these two questions should be answerable in a matter of days–not weeks, months or years. And I’m certain I know the answers without seeing the model results: CAS and STACRs are wildly non-economic, and will have positive economics only in a very small percentage of possible scenarios. Watt now is saying that FHFA is “working to develop additional metrics to quantify and describe the amount of credit risk being transferred.” That’s good. Next, it needs to compare that quantification of the “credit risk being transferred” with the amount of guaranty fees given up as interest payments on the CAS and STACR tranches; if the latter is greater than the former the securities are non-economic, and FHFA should stop requiring Fannie and Freddie to do them. It ain’t rocket science, Mel. Care to solve a conundrum? How can the government get the GSEs out of government control without recapitalizing them? They’ve pretty much stated they want to do both. Or is this so nuanced that when the administration signals that the “object” of retaining a buffer is not to recapitalize, they are nor denying that it may result as a byproduct? I’ve briefly looked at the spate of comments and followup stories to Mel Watt’s testimony last week, and haven’t seen anything surprising. As I’ve noted before, there are four broad paths reform could take: replacing Fannie and Freddie with a completely different mechanism (along the lines of Corker-Warner, Johnson-Crapo, or the Urban Institute or Milken Institute proposals); replacing them with something that looks and operates very much like they do (e.g., the MBA proposal); reforming, recapitalizing and releasing them, and keeping them in conservatorship indefinitely. The first two would require an act of Congress, the third could be done administratively, and the fourth is what we have now. Ironically, the upshot of the Watt testimony last week was to make the fourth option more palatable, by reducing the possibility of a draw from Treasury based on accounting volatility (or, far less likely, an operating loss). Leaders in Congress have made it very clear that they want to have a say in how the secondary market is reformed, so it hasn’t been surprising that first Mnuchin and now Mel Watt (and Bob Ryan) have said that this is the preferred course of action. But it doesn’t rule out administrative reform (and a subsequent recapitalization of Fannie and Freddie); it just means that neither Treasury nor FHFA will initiate such a process before it either becomes clear that Congress will not be able to agree on a reform approach that is workable and desirable (with the most likely stumbling block being an impasse between the Senate wanting a full government guaranty on the securities issued by the “reformed” guarantor and the House wanting no guaranty at all) or there is a ruling in one of the court cases that puts the net worth sweep in jeopardy or invalidates it. The combination of the economics (with the government still having the rights to Fannie and Freddie’s profits once an adequate capital buffer has been retained) and the politics now make it likely, in my view, that it will take BOTH an evident failure of the legislative reform process and some negative (for the government) development with respect to the net worth sweep to trigger an administrative reform proposal. Otherwise, it will be too easy just to stay as we are, with everyone saying how unacceptable the status quo is but no one willing or able to do anything concrete that can change it. Any thoughts on the dynamics going on in politics right now or if Trump’s apparent shrinking capital to get ACA and Tax Reform done could cause sooner action on the admin part. I just don’t see Trump standing still if Congress/Senate continue on current path of inaction. Does the MBA call for the replacement of FnF or just to aid other parties in entering the mortgage market? Would it be good for shareholders? This is their first point here, and the intent is to keep them as viable Guarantors. With FnF released, acting as viable Guarantors, it would be a win for shareholders(not as big as recap and release) would it not? The MBA’s proposal is to replace Fannie and Freddie’s existing federal charters with new ones, which potentially could be made available to other credit guaranty companies. Fannie and Freddie as they currently exist would either be wound down or undergo some type of transition (with details to be specified) to convert them to companies that would operate with the powers and restrictions conveyed by their new charters. As I said in my current post, the MBA’s paper, “GSE Reform: Creating a Sustainable, More Vibrant Secondary Mortgage Market,” contains very few specifics, so it’s difficult to know for certain exactly what it envisions for the new system. If I go on what the MBA has advocated for the past couple of decades, though, I would bet that it would seek to limit the business scope and market power of the new type of credit guarantor it’s proposing as a substitute to a reformed Fannie and Freddie operating under their current charters, in a way that gives banks more underwriting flexibility and results in higher mortgage rates that ultimately would increase the profitability of the $3.7 trillion in single-family loans and MBS banks hold in their portfolios. There is a clue to the MBA’s posture in a phrase from the one sentence you quote from its paper: “reasonably supporting their emergence as viable Guarantors.” “Reasonably supporting” is an odd formulation, which I take to mean, “we’ll give them some help, but not too much.” And “viable” is not the only goal I would set for the new credit guaranty system; we should be aiming much higher than that, to include objectives for the lowest attainable cost and widest attainable availability to a broad range of homebuyer types. I believe the MBA would be perfectly happy with a secondary market system that is built around a generic credit guaranty process—with a single security, high (“bank-like”) capital requirements, and multiple guarantors (including one or more owned by a consortium or consortia of large banks)—that does a modest amount of business at higher guaranty fees than we have today. That, however, would be good neither for homebuyers nor for the existing shareholders of the two companies. Tim, saying that a favorable ruling is needed to get Fannie out of conservatorship in some way equates our status to pre-Trump election where the main catalyst was the courts. I don’t know if you are saying this intentionally, to reduce pressure from Mnuchin acting independently, but your last paragraph really puts us in no different position than we were over a year ago, needing the courts! I’ve always thought that a favorable ruling in one or more of the net worth sweep cases was likely to be required to give impetus to an administrative proposal for mortgage reform. What changed with the election is that we got a Treasury Secretary who seemed committed to taking on the issue of getting Fannie and Freddie out of the government, and also understood (I believe) the complexities involved in dong so. We then had the setback of the DC Circuit Court of Appeals ruling in Perry Capital case, which made it much harder for Mnuchin to initiate settlement talks with plaintiffs in the lawsuits (since from the government’s point of view there seemed nothing that need to be settled). You can’t reform, recapitalize and release Fannie and Freddie without settling the lawsuits (although you can eliminate them legislatively). So we may be “in no different [a] position than we were over a year ago,” but we’re there for different reasons. Hi Tim. Regarding Ryan’s comments about not letting the GSE’s out of conservator-ship without Congress, even if Trump Admin asked them to…Would I be incorrect in concluding that the expiration of the Omnibus Bill would give Mnuchin the freedom to act outside of congress? As always, thanks for your time. No; I think the existence or expiration of the “Jumpstart GSE” legislation has little bearing on what Mnuchin may nor may not want to do with Fannie and Freddie. agree with the attractiveness of the status quo for many involved in the process and, generally, whereas inertia might be the greatest force in the universe, it most certainly is on capitol hill. yet i wonder whether as trump administration initiatives get pushed out, with tax reform/regulatory reform/immigration reform/the wall etc going nowhere quickly, at some point the trump administration seeks to achieve what it can independent of congress, with gse reform being the most feasible example. mnuchin is an expert on gses and must cringe when he hears crapo and corker pontificate without substance on the matter. at some point, the political worm may turn and actually achieving something may become more attractive to the trump administration than status quo. I wish I could be optimistic about that. While the current disarray within the Trump administration makes predicting what it might do in the near or intermediate term almost impossible, I doubt that reforming the secondary mortgage market would be on the list of issues the president knows, cares and has an opinion about, and would see as the sort of high profile “win” that could offset his troubles with Congress or reverse his political fortunes. The fact that mortgage reform is not an issue that is well understood by or a priority for the general public (although it should be) doesn’t help here either. I’m curious if you have any thoughts regarding Mnuchin’s comments earlier today that the dividends should be expected to continue. The following dialogue was also both interesting and strange, given that you would think Watt has addressed this topic with Mnuchin by now if they are speaking extensively on the matter. There may not actually be a disagreement or a contradiction here. Mnuchin may be talking about the PSPA dividend over the long term–which the DC District Court of Appeals has ruled properly belongs to Treasury–while Watt is speaking of the desirability of withholding payments of these dividends long enough to build a reasonable cushion of capital to prevent Fannie and Freddie from having to take a future draw from Treasury because of temporary accounting volatility in their quarterly earnings. But we’ll see what happens on June 30– whether in fact the dividend payments ARE withheld, and what Watt and Mnuchin then say subsequently. Mr. Watt posited in his opening remarks that tax reform as it pertains to DTAs could include an exeception for companies in C ship. He mentioned one or two other possible ways so as not to hurt GSEs with a “temporary” hit due to 15% corporate tax rate. I’ve thought this for a while but more as too good to be true. Care to speculate on whether those sentiments were cleared by Tsy? Hearing related…Corker’s thesis is that ending sweep would change public perception, which he is against. His solution is trust me, take a draw. Watts’s position is that to take a draw when it can be avoided by capital retention is his direct responsibility, his job as conservator. In other words, he’s responsible to avoid having to take a draw. My take…Corker can’t be trusted. Taking a draw would lead to more spin regarding failed business model. Corker’s issue with perception is that he just doesn’t want the public to perceive a healthy GSEs. I am leaving a bit later on this afternoon for two and a half weeks in Europe (for fans of My Fair Lady, I’ll soon be boarding “a plane for Spain that’s mainly in the rain”), and will be gone until Memorial Day. While I’m away I’ll be checking this site less frequently, so that means responding to comments and questions with a considerably longer time lag than usual. Before heading out, though, let me briefly give my take on what I know about Mel Watt’s hearing before the Senate Banking Committee this morning (I read his prepared remarks, and also have seen summaries of some of the back-and-forth with selected Senators). I liked the fact that Watt argued and laid the groundwork for suspending Fannie and Freddie’s net worth sweep payments beginning next month. Unlike the March 31 payments, I think the companies now WILL retain the earnings they otherwise would have paid to Treasury on June 30, and will continue to retain them until they build up a capital cushion that Watt feels is sufficient. I do not believe Watt would have been so direct with Senate Banking Committee members about the need to suspend sweep payments to build capital had he not had the backing of Treasury Secretary Mnuchin. As I’d noted in earlier comments on this topic, because of the February 21 opinion by the DC District Court of Appeals in the Perry Capital case Mnuchin had no political cover for suspending sweep-related payments; as conservator Watt does have such cover, and in his colloquy with Senator Corker he employed it effectively. From what I read about Corker’s position, he was claiming that Fannie and Freddie having no capital and risking a draw in the event of quarterly accounting volatility (which he knows many opponents of the companies would call a “bailout”) is better than allowing them to retain earnings, which in his view would “signal to the world that something was happening that was not.” In other words, with Treasury taking all of the companies’ capital Corker believes Fannie and Freddie are in a corner, and he doesn’t want anyone to think they’ll be able to get out. But it’s fairly clear the administration doesn’t see it that way. A “bailout” of Fannie and Freddie due solely to the fact that they aren’t allowed to retain any of the substantial profits they’re now making–which Corker says would be a non-event–would reflect badly on the administration on whose watch it occurred. Mnuchin and company get that. Any thoughts on the capital buffer comments that Watt deferred to Mnuchin with a smile? Thanks for that thorough response. I’ll try to find copy of video. It might have been that MV stated that the tax reform could be scaled in or enacted later. Just not sure. Enjoy Spain. I simply love MFL. Saw it in my younger days with three of four major players. Harrison, Coote and Halloway. thanks for your thoughts and have a good vacay. spanish reds are very nice. i think this was the first time someone stood up to corker, and i think mnuchin owes watt a solid. Thanks for taking the time to share your thoughts on today’s events. Enjoy your trip. If in Spain (in the rain), hopefully you make it to Catalunya. Es muy hermoso! In Catalunya now, for this weekend’s Formula 1 Gran Premio de Espana at the Circuit de Barcelona-Catalunya, about 20 miles from downtown. Y no hay lluvia (the rain was in D.C.)–should be sunny until we leave for Paris on Tuesday. Great! Hopefully, you’ll find yourself in Elf Corner (Turn 1). Don’t know if you’ve been to the region before (you probably have), but if time permits, I highly recommend a visit to Girona (1 hr away); also nearby, the cliff/beach area of Begur/Sa Tuna; and if hiking is desired, the Pyrenees mountain train ride up/hike down from Querabls to Nuria and back again is amazing and peaceful. All destinations are within and hour or so of where you are. Disfrutate! They already announced those dividends. Will be interesting to see what happens, but when I listened to Watt speak, I do think that steps will be taken in a better direction but it remains unclear if and when things are going to materially change. Watt was pretty clear about being as neutral as possible and I’m optimistic, and if you put all the pieces of the puzzle together it’s hard to not arrive at that conclusion. Anyway, I’m just trying to figure things out just the same as everyone reading this. I’m not aware that Fannie and Freddie have “already announced those dividends [for June 30].” Fannie’s first quarter 2017 earnings press release said, “Fannie Mae expects to pay Treasury a dividend of $2.8 billion for the second quarter of 2017 by June 30, 2017,” while Freddie’s first quarter release read, “Scheduled dividend obligation to Treasury in June 2017 will be $2.2 billion…” Both statements are conditional. If FHFA thinks the companies should not pay their June 30 dividends in order to build a buffer against accounting-related earnings volatility, those dividends will not be paid. Based on Watt’s testimony on Thursday I believe they will not be, but we will need to wait and see. Spot on. If the GSE take any type of draw, Corker will spin it as a failed model that needs to be wound down. I think Mel Watt and Mnuchin had a conversation to get the GSE in front of the curve in the event tax reform happens soon. Regarding today’s verdict in AIG, what are your thoughts in relation to the GSE’s. John Carney is celebrating the news but there are obviously many differences in the cases – including that AIGs 20% stake that remained in private shareholder hands still retains 20% economic interest, whereas the 20% GSE stake left in private shareholder hands currently retains 0% interest. Any thoughts on Adolfo Marzol (Former Fannie Mae SVP, EVP, and Chief Credit Officer) as senior advisor to HUD chief Ben Carson that you can share? Will he help advance a fair and balanced mortgage finance system in your opinion? I think Adolfo will be an excellent addition to the HUD team under Carson. I worked closely with Adolfo at Fannie, both as a colleague and with him as a direct report to me. I found him to be knowledgeable, market smart, principled, creative, hard working and results oriented. I re-established contact with him after getting out from under the last of the OFHEO-related lawsuits in 2012, and we have had several conversations about mortgage reform since that time. I think he sees things clearly, sensibly and without bias. I’m glad he’s going to HUD. govt reform often is addressed at the last problem, not the next problem. it appears that treasury secretary mnuchin wants to take a “holistic” approach to housing finance reform, indicating that he sees fha guaranteed loans and gse guaranteed loans as part of a single housing finance universe. i wondered if you have thought about what holistic housing reform would look like? beyond your excellent “fixing what works” proposal on this blog, would there be additional thoughts that you would add? or is a capital adequacy fix using functional risk-based capital levels and a utility-like supervision applicable to all potential issues? As I’m sure you know, Rosenberg makes a point supportive of reforming the system around Fannie and Freddie–not replacing them–by noting the large and successful (extremely low delinquency and loss experience, due to REAL pari passu loss sharing with lenders who qualify as underwriters) multifamily businesses the companies have, and have had for almost thirty years. There are a couple of ways to think about “holistic” mortgage reform. One is to attempt to reform all aspects of the mortgage lending process coincidentally and consistently. A second is to look at each major aspect of mortgage lending separately, but design and implement reforms in a manner that fits with where you’d like the overall system to be eventually. The second, obviously, is much easier, and I believe that’s how Mnuchin is thinking about approaching it. If you start with Fannie and Freddie and get them right, you can then turn to other players like the FHA, and make changes to their capital, operations and oversight–consistent with what you’ve just done with Fannie and Freddie– that prevent risk from migrating to the weakest capitalized, managed, or regulated lending source. Thanks. The notion that dividends paid pursuant to the net worth sweep are illegal under Delaware law because they are not funded by current or prior year earnings and therefore deplete capital (to the disadvantage of creditors and preferred shareholders) is an interesting and attractive one; now all we need is (a) someone to bring (or amend) an action based on this notion, and (b) a judge to agree with it! My next “Delaware milestone” is plaintiffs’ answering brief to defendants’ motion to dismiss (filed on April 17), which is due to be filed on June 16. The counters plaintiffs have to the arguments made by defendants in their April 17 motion will be informative to my and others’ handicapping of the chances of the Delaware action being successful. Bloomberg reported this morning that Blackrock has their own whitepaper on GSE/housing reform (https://www.bloomberg.com/politics/articles/2017-05-05/blackrock-says-don-t-recap-and-release-fannie-and-freddie). On one hand the article says they are against recap and release, and on the other hand if you read further down it says Blackrock said MBS should have an explicit government guarantee, and that private capital should stand in front of taxpayers in case of a downturn. Joe Light has a history of being an anti-GSE journalist so while the headline might seem negative, it seems like Blackrock is also in favor of an equity-based model? Curious what you make of Blackrock’s view. I will need to read the Blackrock paper before I can make any comments on it. I should be able to do that some time this weekend. re blackrock proposal, when you are ready to respond to it, i would love to get your reaction to what i think is a self-contradictory, if not schizophrenic, stance that this blackrock proposal and many other proposals have: we are opposed to bailouts, the GSE bailout was awful, and oh by the way, we want an explicit federal guarantee so that the next bailout is already ordained, in the event exercising upon the guarantee becomes necessary. two other things that i find blackrock and other proposals dont address: i) the need to settle litigation (how do they propose to raise substantial amounts of private capital while litigation seeking over $100 billion in damages/vacating the NWS is still active? ), and ii) the need to harness the broad and deep expertise that exists at fnma and fmcc, but is nowhere else at present. if they think you can push a button and transfer this expertise from the GSEs to the next organizational iteration that they have in mind, i know well that organizational expertise and competence does not move as if one can email it to a new organization. I was expecting more substance from a paper with Blackrock’s name on it. Instead, I found myself breezing through what essentially is a political document, which advances superficial, unsupported and in some cases inaccurate arguments in support of the notion that the most important objective of mortgage reform is to put an explicit government guarantee on conventional mortgages financed in the secondary market (which, of course, would be of great benefit to Blackrock and its clients). I found nothing new or insightful in the Blackrock piece. It follows the playbook of many other “reform” pieces that turn reality upside down by insisting that the obvious alternative of updating the capital requirements of Fannie and Freddie to post-crisis stress standards is somehow a dangerously irresponsible course of action (because it builds on what we’re simply going to assert, against irrefutable evidence to the contrary, is a “failed business model”), compared with the authors’ recommended solution of a new, vaguely outlined substitute mechanism with few operational details and whose implementation and transitional challenges are acknowledged but neither confronted nor addressed. Most of my criticisms of the Blackrock paper are already made in my post on the MBA’s proposal. An explicit government guarantee on MBS not only is unnecessary if FHFA follows HERA and updates Fannie and Freddie’s capital standards to current standards of taxpayer protection, it also would face daunting obstacles to achieve. It could not be added administratively; it would have to be legislated, which means being accepted by the Chairman of the House Financial Services Committee, Jeb Hensarling, whose own prior legislation, the PATH Act, went in the opposite direction and removed all of Fannie and Freddie’s agency indicia entirely. The Blackrock piece also is totally silent on how much capital would be required of the de novo credit guarantors to get that government guarantee. With excessive amounts of required capital, the secondary market credit guaranty mechanism breaks down, and we revert to a deposit-based, bank-centric mortgage system, with much higher mortgage rates and greater impediments to access by affordable housing borrowers. I would have expected the Blackrock authors to delve into the capital implications of an explicit government guarantee on MBS before giving it such a full-throated endorsement. Finally, there is the “elephant in the room” of the litigation against Fannie and Freddie today. At the end of this year the companies will have zero capital, because Treasury and FHFA have insisted—and the DC Circuit Court of Appeals has concurred—that they have a perfect legal right to take all of a credit guarantor’s capital, for whatever reason and whenever they wish, and to keep that capital in perpetuity with no compensation to the shareholders who originally provided it. If Treasury doesn’t settle the lawsuits against the net worth sweep, how can it possibly expect investors to pony up the mammoth amount of new capital required to implement the Blackrock proposal? And if Treasury does settle the lawsuits, wouldn’t it make so much more sense just to use the companies that already exist—with updated capital standards and more professional regulation—as the basis for the future system? Not to Blackrock, apparently. Government guarantee on MBS is unnecessary if FHFA follows HERA and updates Fannie and Freddie’s capital standards to current standards of taxpayer protection. This is a killing sentence. Question Tim, why do you think there is almost no discussion amongst the pro and anti GSE factions regarding the settlements paid to the GSE’s for fraudulent actions by TBTF banks. It should be argued the GSE’s would never have needed a gov. bailout without the bank fraud perpetuated against the GSE’s. I haven’t seen much advancing this observation. I think there are two reasons why the impact of losses from loans sold to the companies that did not meet their stated representations and warranties has not been more of a topic in discussions about their pre-crisis financial condition. The first one is that it is a fairly esoteric topic, without good or readily available data to inform it. If you’re willing to do some research and digging, it’s possible to come up with a figure for the dollar amounts of settlements obtained by FHFA on behalf of the companies for problem loans sold to them in violation of their reps and warrants. But the settlement figure is different from–and lower than– the credit loss number. And only the largest companies who sold misrepresented loans to Fannie and Freddie were gone after legally. But I think the bigger reason that the fraudulent loan issue doesn’t get more play is that it pales in comparison to the real dispute over the companies’ “bailouts”: were they a reaction by Treasury to weaknesses in the companies’ operations that made it in the best interest of the financial system for Treasury to place them in conservatorship, or were they a planned takeover engineered by Treasury for ideological and policy reasons? If you buy into the first explanation, stirring in the bad loans sold to the companies by banks and other originators doesn’t change the contention that they were weak and needed a rescue; if you don’t (and I certainly don’t), the existence of the fraudulent loan sales just adds further ammunition to what already is a strong argument that Fannie and Freddie never needed to be taken over by the government. Thanks for your reply and this blog. Can a tax credit offset funds taken by the Treasury, if the courts rule against the NWS; and if so can that add to their capital reserves? I’m not sure why my prior post of this question was deleted. This is probably a good time to respond to the second part of this comment. For the benefit of new readers (or commenters), since I started “Howard on Mortgage Finance” a little over a year ago my goal has been for the site to be a source of objective and (I hope) reliable information on issues related to mortgage finance in general and mortgage reform in particular. By design, it’s not a message board—where people can just “air their views” without offering some substantive contribution, or post items in the hope that someone else will interpret or analyze them. Other sites exist for these purposes. The site also isn’t an “ask me anything” forum. Both for my own benefit (I manage the site part time and pro bono) and for that of my readers, I answer questions selectively, based on whether I think the question, and the answer I have for it, will be of interest or informative to an audience that extends beyond the person who has asked it. That’s a pretty tough standard, and unfortunately it means that many inquiries that fall short of this subjective “insightful question, lots of people might be interested in the response” criterion either go unanswered or get deleted. For those whose comments fall victim to this policy, I don’t intend it as a criticism. Thank you; I’m enjoying the site as always and want to thank you again for all the work you do here. You’re welcome. And there is one other important “ground rule” for the site that I neglected to mention in the answer above but have discussed previously: I do not comment, pro or con, on readers’ ideas on, questions about or proposals for recapitalization schemes for Fannie and Freddie. Capital restructuring is not my area of expertise. I also believe that the tradeoffs that will inevitably be involved in a Fannie or Freddie recap (which I do believe eventually will happen) are best made by those who now or will in the future have the most amount of “skin in the game” with the companies. Finally, the fact that I do still hold shares in Fannie Mae (all of which I acquired as an executive with the company, with the exception that in 2008 I exchanged half of the value of my common shares for an equivalent value of shares of junior preferred stock) is another reason I’ve decided to stay away from offering advice or commentary on recapitalization issues– to avoid any appearance of conflict of interest. Also, said” want to be careful we don’t solve the fannie freddie issue to find out we have an FHA issue”. What exactly does he mean? Some of the fellow travellers proposals? No. Since Fannie and Freddie were put into conservatorship– and are effectively being managed by FHFA– the amount of outstanding FHA insured loans has grown rapidly. Most FHA loans are financed through Ginnie Mae securities, and for the last few years there have been more Ginnie Mae mortgage-backed securities issued than Freddie Mac MBS. Many people believe this is because FHFA has been too conservative in its setting of Fannie and Freddie’s guaranty fees relative to the risk of the loans they have been acquiring in the last several years, and that the opposite may be true for FHA. One way “solving the Fannie and Freddie issue” could create “an FHA issue” would be if Mnuchin and crew set capital standards for the companies that are out of alignment with the pricing of the FHA, causing risky business to go there without adequate fees or reserves to cover that risk. I think it’s a good thing that Mnuchin is thinking about Fannie, Freddie and the FHA holistically. Thank you for all that you do here! I know in the past you have expressed that the credit sharing agreement model is bad for the GSEs. Fannie Mae seems to keep issuing more of those securities. I understand your point that they probably are detrimental to protecting the companies because they don’t offer much protection in reality if things go south. Does that mean they should be a very low risk investment for the return for the people buying them? What is the risk to investors picking up the CRTs now? I’ve made different points about credit risk transfer (CRT) securities used by credit guarantors. Most recently, in “Risk Transfers in the Real World,” I explained why reform proposals like those of the Urban Institute and the Milken Institute that rely on CRTs as a substitute for upfront equity capital are inherently unworkable and dangerous. Elsewhere I have said that I believe the CRTs Fannie and Freddie are now issuing– CAS and STACRs, respectively–are uneconomic, for two reasons. First, they provide no credit loss sharing until after the companies have taken 100 basis points of losses on the pools these securities have insured, and given the high credit quality of the loans in those pools it is unlikely their lifetime loss rates will hit even 50 basis points, let alone 100 basis points. Second, CAS and STACRs are deliberately engineered to pay off before most of the credit losses can hit them, so even if insured pools DO have a loss rate above 100 basis points, the CAS and STACR risk-sharing tranches will have paid off long before loss rates breach that threshold. Fannie and Freddie are issuing CAS and STACRs not because they make economic sense–the companies would be far better off keeping the interest payments they’re making on these securities, which amount to about a third of the guaranty fees on the “insured” loans–but because Treasury and FHFA are requiring them to. For the same reason that CAS and STACRs make no sense for Fannie and Freddie as issuers, they are terrific deals for investors: they have very attractive floating-rate yields, with almost zero risk of loss of principal before they are repaid. Thank you for your very thorough posts over the past few years. Your book was riveting and it was a better read than the big short! 1. I was going over Freddie Mac’s Q12017 financial statements and noticed that the DTA barely moved from the last quarter. Additionally there was a tax expense of $1.1bln under the companies consolidated results of operations. From what I understand, the DTA should have been adjusted in the period the tax expense was made, and as a result the tax expense should have been 0? Is this something that gets adjusted at year end. In other words, why are these companies paying taxes today? 2. If that is indeed the case, how will a corporate tax cut affect the earnings long term, post a 1 time DTA write down? On your first question, you may have a misunderstanding about what deferred tax assets (DTAs) are and how they work. It seems as if you are equating them to tax-loss carry-forwards, thinking that as long as DTAs are positive a company should not have to make a provision for federal income taxes on its books. But DTAs aren’t carry-forwards; they arise because of timing differences in when expenses are deemed deductible and revenues are deemed taxable by the IRS and by the accounting standard-setters, as reflected in GAAP (as interpreted by a company and its external auditor). Freddie’s DTAs didn’t change in the first quarter of 2017 from the fourth quarter of 2016 because the net of those timing differences didn’t change, but it still had to provide close to 35 percent of its pre-tax book net income ($3.321 billion) as federal income tax expense ($1.110 billion). Both Fannie and Freddie have relatively few deductions that reduce their federal income taxes from the 35 percent statutory rate, so as a result in any given quarter they typically deduct between 30 and 35 percent of their pre-tax net income as federal tax expense; Freddie’s first quarter taxes were within that range. On your second question, a cut in the statutory corporate tax rate would be a short-term negative for both companies, and a long-term positive. The amount of time it will take for the negative effect to be offset by the positive effect will differ for Fannie and Freddie, because they have different amounts of deferred tax assets and different expected annual pre-tax earnings. In Fannie’s case, it had $33.5 billion in DTAs at December 31, 2016 (hopefully it will have been able to work that number lower in the first quarter of 2017, but we’ll see on Friday), and I estimate its long-term earning power to be around $16.5 pre-tax per year. Given those two numbers, irrespective of how much the corporate tax rate is cut, it will take a little less than six years before the one-time negative of the initial DTA write-down is offset by the cumulative increase in annual after-tax earnings, relative to what they would have been at a 35 percent corporate tax rate. (To give an example, a cut in the corporate tax rate to 25 percent would cause Fannie to have to immediately write down $9.6 billion of its $33.5 billion in DTAs, but that same 25 percent tax rate will raise the after-tax earnings on $16.5 billion pre-tax by about $1.7 billion per year–from $10.7 billion to $12.4 billion. After six years of an additional $1.7 billion in after-tax earnings, Fannie will have “paid itself back” for the initial $9.6 billion DTA write-down, and after that time the lower corporate tax rate will be an unalloyed positive.) Because Freddie has fewer DTAs relative to its pre-tax earning power, its break-even period would be shorter than Fannie’s– about four years. As I’ve said previously, given the February 21 ruling by the DC Circuit Court of Appeals that the net worth sweep is legal, I do not expect Secretary Mnuchin to support withholding the dividends mandated by the sweep agreement unless and until there is a development in one of the other lawsuits that calls into question the continued legality of the sweep, or Treasury is ready to signal its support for reform of the mortgage finance system in a manner that involves the recapitalization of Fannie and Freddie and their release from conservatorship. My dilemma is he says he wants GSEs out of government control and he also wants housing reform, yet he won’t declare that he’s for recapitalization. What sort of housing reform does not include recapitalization of the GSEs? Sincere question. Oh, how about the MBA’s proposal, that I just wrote about in this post? That requires either liquidating Fannie and Freddie or running them through receivership, and creating two new (but very similarly configured) companies that then would need to be capitalized de novo. The reality is that most members of Congress do not currently support reforming, recapitalizing and releasing Fannie and Freddie. On the assumption that Mnuchin does (and I believe he does), in order for him to get Congressional support–or a minimum its acquiescence–he will have to be able to show that his plan works, and achieves the objectives of widespread, low-lost availability of mortgage credit to homebuyers at minimal risk to taxpayers, and the plans of opponents of Fannie and Freddie don’t achieve any of those goals. This is a process that will take time, and as that process is playing out it would be counterproductive for Mnuchin to tip his hand–and invite a hardening of opposition–by making such an overtly pro-Fannie and Freddie move as coming out in favor or suspending net worth sweep payments. My question wasn’t clear. Yes, I realize the options you mention in paragraph one. My point was given what we think is his vision, what sort of option wouldn’t include recapitalization? I can’t think of one, though Ackman’s comes closest. If he’s willing to speak freely about getting GSEs out of government control and reforming housing, my hope was he’d address the risk of sweeping profits, leaving GSEs vulnerable. I don’t think the political headwinds should be that strong given the risk-alternative of not addressing sweep. Even Watt sees the risk. Oh well, I remain stymied by the politics but only because sound reason should. I’d hope, cut through the D.C. rhetoric. Keep up the stellar work. Your service is invaluable. Ron, my understanding of Mr Howard’s comments, and he’s been very consistent, is Mnuchin isn’t in a position to take a side one way or the other until an actual workable, implementable plan is developed. Until that point, he’s going to be operating/projecting that he’s neutral or in agreement with the current status quo. The reality is we won’t know, until we know. In other words, take Mnuchin’s public comments with a grain of salt. On twitter last night I asked Joe Light, the writer of this article, who the Treasury “spokeswoman” was who made these statements. So far, he has not responded back with her name, or the time he spoke with her. May I suggest, as a better way of understanding Steve Mnuchin, the new treasury secretary, the book by Dr. Alan Nafzger, “Steve Mnuchin Finance, Entertainment, Treasury” Copyright 2017. My hope is that you, Tim, or one of your very knowledgeable followers, will be able to find clues to his future plans and policies concerning the GSEs. I could and may read this autobiography myself, but I don’t have the expertise or knowledge that you have about finance that may allow you to read between the lines. I’ll distinguish between the “utility model” as a concept and what I’ve proposed for Fannie and Freddie. Generally speaking, a utility is an entity, typically shareholder-owned, that provides a (usually essential) public service, for which it is granted a monopoly (or a near-monopoly) in exchange for accepting regulatorily imposed limits on either the prices it can charge or the returns it can earn. This morning on Fox business, Maria Bartiromo asked Mnuchin, “you said before to privatize fannie, what are your plans”, or something to that effect. His response was, “I never said privatize,” and then launched into his standard “we need reform line”. I’m a little confused. If they entities weren’t privatized, how can the tax payer not be at risk? Where would the capital come from to prevent a huge draw on treasury and the tax payers? Or do you think this response was just more gamesmanship? Also, he confirmed that Obama Admin was using profits from the sweep to pay for Obamacare; Any specific implications of this? To me, other than being a bit duplicitous, I didn’t see it being a smoking gun for any of the lawsuits, but I really don’t know and am not a lawyer. The confusion over the “privatization” comment stems from the fact that different people use the same term to mean different things. Currently Fannie and Freddie are de facto nationalized companies. Secretary Mnuchin has said he wants to get them “out of the government.” Those who advocate their reform, recapitalization and release often refer to the end state of that process as “privatization,” meaning the companies no longer would be owned by the government but (again) by their private shareholders. But there also is a faction in Congress–of which Jeb Hensarling, chairman of the House Financial Services Committee, is a prominent member–who use the term “privatization” to mean the removal of the attributes in the companies’ federal charters that other “fully private” companies do not have. I suspect that Mnuchin now is aware of the dual, and opposing, meanings of the word privatization, and thus won’t allow himself to be characterized as being for or against it. But note what really was said here. Bartiromo said the Obama administration took money from many agencies to pay for Obamacare, and Mnuchin agreed that the proceeds from the net worth sweep (which went into the government’s general revenue fund and thus were not earmarked for any specific purpose) were used to pay for “other parts of the government.” He didn’t say that sweep payments were used to fund Obamacare because that’s not knowable. Money is fungible. Once they go into the general fund, proceeds from the net worth sweep become indistinguishable from all other revenues that go into that fund, so it’s not possible to say which sources were used for which uses. The other point worth making here is that some on Twitter allege that the reason the Obama Treasury initiated the net worth sweep in August 2012 was to create a source of revenue to finance the subsidies in Obamacare. I am aware of no evidence that supports that contention. Would you please comment on Mnuchin’s other remark regarding the Tsy life line that keeps the GSEs alive? For me, the key phrase in that last sentence is “right now.” Unlike officials in the Obama Treasury, Mnuchin is not saying that the only reason Fannie and Freddie survived the crisis is the $187 in senior preferred stock they got from the government between 2008 and 2011. If he did say that it would be problematic, because it isn’t true. In my interpretation, though, by saying “right now” he’s drawing attention to the fact that the companies have almost no capital today (due to the net worth sweep), and because of that absence of capital the only reason that they can stay in business is the Treasury line of credit. Without Fannie and Freddie having capital of their own the taxpayers ARE at risk, and that’s what he wants to change (in my view, by reforming and recapitalizing them). Tim, What are the chances of receivership as some are discussing? Before Fannie and Freddie could be put into receivership Congress would need to have agreed upon, and passed, legislation creating a secondary market mechanism to replace them. And as I note in the current post, such legislation would need to include a detailed plan for the transition from the existing system, based on Fannie and Freddie, to the new one. There are many complex issues that must be identified and overcome in designing such a transition. To date, the furthest any advocates of replacing Fannie and Freddie (including the MBA) have come in dealing with these transition issues is to acknowledge that they exist, and to express the fervent hope that somebody will figure out how to deal with them all. There is a lot of heavily lifting that will have to be done before the possibility of receivership for Fannie and Freddie becomes anything worthy of fretting about. As stated before, thanks for all you do with helping folks navigate the maze that is all things GSEs. I feel your efforts go above and beyond. With that said and understanding you don’t like to speculate, I was wondering if you would mind guesstimating what you think Q1 results might look like for FnF? I know there are ever-changing variables that make it near impossible to be exact, but do you feel they will have a profitable quarter, and if so, care to put number or range on their revenue or profit expectations? I’m guessing they will report officially within the next few weeks? Thanks again for your continued insights. If the timing of last year’s first quarter earnings releases is any indication, both companies should report by the end of next week. I don’t have any reason to think that either company will report first quarter earnings that are too far away from what I calculate to be their “steady state running rate” per quarter of $2.7 billion for Fannie and $1.7 for Freddie. The most significant factor that can cause a big quarterly swing is the effect interest rates have on the market value of the companies’ derivatives, but interest rates were little changed from December 31, 2016 to March 31, 2017 (which is when the “marks” are made), so I wouldn’t expect that to be an issue this quarter. That’s not to say that there won’t be other one-time events that move the numbers away from the steady state figure, but I wouldn’t expect too much of a divergence. Ignore the Senior Preferred: $2.7 billion for Fannie BEFORE dividends for junior preferred shares? Yes, although as you know there now are no dividends being declared (or accrued) on the junior preferred. Were those dividends to be turned back on they would amount to about $250 million (after tax) per quarter. one thing i never understood is why qualification for loans to be financed and guaranteed by GSEs is based upon size of loan rather than some other criteria, such as risk. for example, why would it not make sense for fnma and fmcc to acquire jumbo as well as smaller loans provided that they satisfy a low risk parameter, and permit other guarantors to enter the landscape, following the MBA suggestion, but with respect to all higher risk loans? these new entrants would be smaller and more specialized, and would have their own capital sources seeking higher returns, and these entrants would charge a higher guarantee fee. the notion would be that if there was a specialized high risk market segment serviced by the type of new entrants that MBA posits, there would be a reduced likelihood that fnma and fmcc would expand into higher risk products that will inevitably return once memories of 2009 fade somewhat. you would in essence tranche risk by segmenting the market, with the MBA new entrants playing a complementary rather than a competitive role. this might even make it easier for fnma and fmcc to service low income housing market, as they would not also have to service the higher risk markets that the new MBA entrants would focus on. this all may not make sense. The original idea behind the maximum loan amount for Fannie and Freddie was a realization by the Congresses that gave the companies their federal charters (or subsequently amended them) that those charters conveyed advantages and benefits that had value, and they wanted that value to be channelled only to the low- middle- and moderate-income homebuyers who most needed it to be able to borrow money to purchase, and continue to be able to afford, a home. I’ve never had a problem with that concept. Splitting credit guaranty business by risk is a different matter, and is more complicated. Pre-crisis, there would have been little reason to do that. Jumbo loans (those with balances above the Fannie-Freddie loan limit) were on average very safe, because borrowers in that size range had higher incomes and more assets, and also generally made larger down-payments on a percentage basis. Below the Fannie-Freddie loan limit, the companies were able to limit their exposure to losses from higher-risk loans by mixing them with large amounts of lower-risk loans, and also were able to make riskier, low-down-payment loans more affordable to lower-income borrowers through cross-subsidization (using the dollars from small amounts of “excess” guaranty fees charged to lower-risk borrowers to make more sizable reductions in fees for targeted groups of higher-risk borrowers). Post-crisis, it’s not clear how effective cross-subsidization will be in expanding the range of borrower types able to afford a guaranteed loan. It depends almost almost entirely on where and how capital requirements are set. The primary reason I’ve been making such a big point of having FHFA comply with HERA and specify a true, honest, risk-based standard for Fannie and Freddie (and by true and honest, I mean not the sham Dodd-Frank stress tests it’s been running for the past few years, which have been packed with non-cash expenses to artificially boost the capital numbers) is to see if it is indeed possible, based on real data from the companies, to have a risk-based standard, by category of risk, that can simultaneously protect against a 25 percent decline in home prices nationwide and allow the companies to effectively use cross-subsidization to attract more affordable housing business. I truly don’t know the answer to that. If it’s NOT possible, then there may be an argument for segmenting credit guarantors by risk–giving government advantages to guarantors that finance higher-risk loans to lower-income borrowers, but not to guarantors of lower-risk loans. That would open up a whole other set of issues, however, including political ones. What are your thoughts on Watt considering stopping the sweep, but being convinced not to by the senate letter? It appears to me that Treasury must not have backed Watt in those discussions, or else he would’ve gone through with it. Also, the article mentions Craig Phillips, whom has been discussed here a bit, but in terms of possible solutions mentioned, none of them seem to align with releasing the GSEs. I know you had commented multiple times that Mnuchin knows mortgage finance and that you’d speculate he would do the right thing. It appears from reading the tea leaves that this may not seem to be the case anymore. I’m curious to hear your thoughts, and I know you’ve mentioned that if and when you felt the time was right, you’d get in to get a rational point of view in front of Mnuchin. It appears to me they could use a little direction before they get so far off track. I may not be correct, but I do have an analysis of what’s been going on with the March 31 net worth sweep payments. I believe, consistent with what Joe Light is reporting, that Watt WAS seriously considering allowing Fannie and Freddie to retain the earnings they reported for the fourth quarter of 2016, rather than paying them to Treasury. The evidence for that was the way the March payments were treated in the companies’ fourth quarter and full year 2016 earnings press releases and 10Ks—with Freddie suddenly referring to a “scheduled” sweep payment (it had never used that modifier before) and Fannie changing its table of “Treasury Draws and Dividend Payments” to no longer include the payment to be made in the coming quarter. Both of those changes were deliberate, and would not have been made without FHFA approval. I also think that at the time Fannie and Freddie’s earnings were announced Watt had the support of Mnuchin in allowing the companies’ sweep payments to be retained. What changed that was the February 21 ruling from the DC District Court of Appeals that FHFA and Treasury were within their legal rights in imposing the net worth sweep. The (in my opinion) torturously reasoned majority decision upholding the sweep came as a surprise to almost everyone who was following the legal cases, and it changed the calculus behind what to do with the sweep payments. With the appellate court effectively saying that the $10 billion in combined first quarter sweep payments legally belonged to the government, neither Watt nor Mnuchin had a good public (or political) argument for allowing that money to stay with the companies as capital, so the sweep payments were made as scheduled. I do not believe that Mnuchin has changed his view on what needs to be done to end the government’s control of Fannie and Freddie. As I said at the time of the appellate court ruling, however, that ruling complicated the process for getting to where I think Mnuchin wants to go. He can’t reform, release and recapitalize the companies without settling the lawsuits, but a settlement now would look like a giveaway to the plaintiffs, given the appellate court decision. In his statements since the February 21 ruling Mnuchin has pushed the timing of dealing with Fannie and Freddie into the second half of this year (and perhaps beyond) that. I believe that at least in part that is to see if developments in other court cases involving the sweep—Jacobs-Hindes in Delaware, Collins in Texas, or the appeals of the Saxton and Robinson lower court decisions—produce an outcome that better justifies initiating settlement talks with the plaintiffs. Thanks Tim, really enjoyed your post. Excellent insight as usual. Do you believe that it is reasonable to deduce that in addition to Mnuchin potentially waiting for a favorable court decision involving the sweep before acting, there are other events that might force the action sooner rather than later? Two that come to mind are, 1) tax reform later this year that would cause another taxpayer bailout of the GSEs due to DTA write-downs and 2) GSEs balance sheet equity going to 0 on 1/1/18 which will leave taxpayers on the hook for any future bailouts caused by quarterly business fluctuations. It seems in either scenario, removing the NWS could be soundly justified against critics as it would be done in order to “protect” the taxpayers from having to bailout the GSEs and infuse more capital into them which both Mnuchin and Trump have said is very important to them (protecting taxpayers from future bailouts). 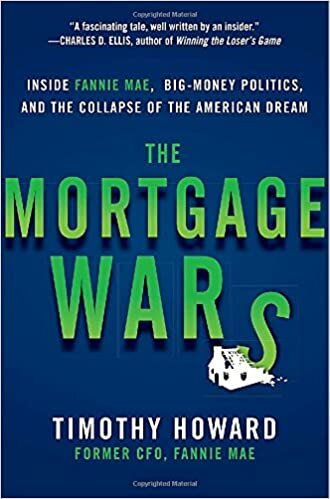 The 1938 creation of Fannie Mae was due to the very fractious and collapsed banking industry which was grossly over leveraged or (dis-economies of scale). America (and Mnuchin) are very fortunate to have your expert eyes on these proposals. Thanks so much for all your writings; they are highly enjoyable and enlightening. True expert. Wish you send the article to banking committee, house finance committee, FHFA, Treasury, and President’s Econ Council. Two small comments about FHFA’s power to set appropriate capital levels for the GSEs. 1. In court FHFA said that it created a “new capital paradigm,” in September/October 2008 when it took over the GSEs and suspended its regular determination of capital adequacy. Now FHFA says that it determined minimum capital to be zero plus $1 so long as the GSEs have an unused government commitment to bail them out in the future. Yes, it takes doublespeak to a whole new level. On your second point, I’m not sure what Goodman and Zhu mean by a “2007 home price scenario.” Their 4 to 5 percent loss figure for Fannie and Freddie makes it seem as if they are assuming that in a future scenario all of the companies’ books would perform as badly as the 2007 book did, which is unrealistic. We know in Fannie’s case that the company remained profitable on an operating basis throughout its worst credit loss years of 2008-2012, so it technically wouldn’t have needed ANY capital to “sustain all [its] losses,” (although it was able to cover some of them from earnings from its portfolio business, now being phased out). In any event, they, like you, effectively debunk the notion that the GSEs would need anything close to the 10% required of money center banks. Thank you for your valued opinion. Do you have any comments or opinion on ICBA White Paper Lays Out Principles for Housing-Finance Reform? I think it’s a good contribution to the dialogue, and I agree with the large majority of the points it makes. The one area in which we have different opinions–which you know if you’ve read this latest post– is that I don’t think it’s either necessary or desirable to try to legislate reform. I think there are ways to maintain the current scale and low cost of conventional MBS without an explicit government guarantee– such as my proposed backstop arrangement– and believe this, as well as a utility-like return cap, could be formalized in an administrative agreement between Fannie, Freddie and Treasury, similar to the PSPAs and the amendments to it. And beyond that, if the reform process is opened up to legislation all sorts of mischief can happen. Better to avoid that if at all possible.